Located 150 metres from the railway station, in the centre of Seefeld’s pedestrian zone, the family-owned Alte Schmiede Hiltpolt offers rooms and apartments with balcony and a spa area with indoor pool. Wi-Fi access is free of charge. 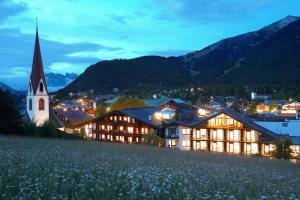 Restaurant Zur Alten Schmiede serves traditional Tyrolean specialities, international cuisine, and fine wines. Half-board is possible with a minimum stay of 3 days. The Alte Schmiede Hiltpolt’s spa area has a sauna, an organic sauna, a hot tub, a sunbed, an infrared cabin and massage showers. Rosshütte, Gschwandtkopf and Geigenbühel ski areas are within 500 metres. A swimming lake is only a few minutes‘ walk away from the Alte Schmiede Hiltpolt. Guests receive reduced green fees at Seefeld’s golf courses and free entrance to the mini-golf course, which is 100 metres away. Fishing in Leutasch, 3 km away, is also a popular summer activity. The guest card provides a 10% reduction to the Olympia Centre in the summer, free ski-bus access and several other reductions. Parking is available free of charge at Hotel Hiltpolt. When would you like to stay at Alte Schmiede Hiltpolt ? Featuring solid wooden furniture, this country-style room has a south-facing balcony.No extra beds or baby cots are available in this room type. Bedroom, living room with pull-out sofa, kitchen, south-facing balcony.Daily cleaning is included. Please note that the final cleaning fee will only be charged if the kitchen was used. Spacious room with solid wooden furniture, country house-style and a south- or west-facing balcony.Please note that the room rate is based on 2 guests. Maximum occupancy is 3 guests (see Extra Bed Rates). The newly renovated apartment in the annex building is just opposite the hotel and features a separate bedroom and a kitchen with dining corner, There is a living-room, 2 flat-screens, and a south-facing terrace. A private bathroom is fitted with a shower.Daily cleaning is included. Please note that the final cleaning fee will only be charged if the kitchen was used. This apartment features a bathrobe. Each day we'll check prices and send you an email for your selected dates at Alte Schmiede Hiltpolt. If you don't have specific dates but would like to check prices for say next weekend or say next month we can check the price too. Click to write a review and share your experience of Alte Schmiede Hiltpolt with other travellers.